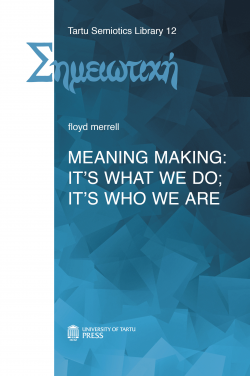 Meaning Making: It’s What We Do; It’s Who We Are is a book about fundamental questions of contemporary semiotics, however written in the style accessible to a wide range of readers. Meaning Making sheds light on the following assumptions, largely following C. S. Peirce: (1) pre-linguistic sign modes of feeling, sensing and experiencing entail consciousness-becoming; (2) consciousness-becoming, culminating in linguistic signs, is always in the process of becoming something other than what it was becoming; and (3) linguistic signs are never complete and consistent, for they continuously draw from pre-linguistic semiotic processes. These processes involve signs incessantly becoming other signs in interdependent, interactive interrelatedness. The three terms carry the implication that all signs are complementarily coalescent; they are always in the process of merging with one another. Illustration of the complementary coalescent processual flow of signs involves split-second decision-making – examples are chiefly from baseball and soccer – when one has no time consciously to think and then act on one’s thinking. Decisions must be made in the blink of an eye, and they must be spontaneously acted on. This rapid-fire semiotic transition from pre-linguistic feeling-becoming to interpreting-becoming emphasizes ongoing process, rather than relatively fixed product. Process is the principle key qualifying Peirce’s concept of semiosis. Floyd Merrell is an eminent contemporary American semiotician, a long-time Professor of Semiotics and Spanish Literature in Purdue University. His numerous books include Signs Becoming Signs: Our Perfusive, Pervasive Universe (1991), Unthinking Thinking: Jorge Luis Borges, Mathematics, and the ‘New Physics’ (1991), Semiosis in the Postmodern Age (1995), Peirce’s Semiotics Now: A Primer (1995), Signs Grow: Semiosis and Life Processes (1996), Peirce, Signs, and Meaning (1997), Tasking Textuality (2000), Living Learning, Learning Living: Signs, East and West (2002), Sensing Corporeally: Toward a Posthuman Understanding (2003), Processing Cultural Meaning (2007), Entangling Forms: Within Semiosic Processes (2010).